To kick off National Ice Cream Month, we rounded up the top trends in the scrumptious world of frozen desserts, from blinged-out ice cream trucks to brewery popsicles. With one taste, you'll know: These aren't the popsicles and banana splits you grew up with. And that's not necessarily a bad thing. In fact, the world of ice cream is tasting better than ever, and the statistics prove it. According to the International Dairy Foods Association, the U.S. ice cream and frozen desserts industry generates more than $21 billion in annual sales. Though some ice cream flavors will always be crowd favorites--like vanilla, which IDFA says is America's top choice--scoop shops and chefs are constantly searching for exciting new flavors and combinations. IDFA predicts two other trends will continue gaining momentum: co-branding between ice cream manufacturers and candy, cookie and fruit makers, as well as an increasing number of brands offering healthier options. And these changes seem to be coming at just the right time. Both men and women say ice cream is the number-one food they sneak while on a diet, according to the 2007 National Ice Cream Month Survey conducted by Impulse Research Corporation for Unilever Ice Cream. That's one reason products like Paciugo gelato, Laloo's goat milk ice cream and Gaga's SherBetter are increasing in popularity. 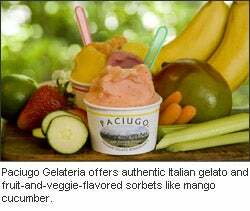 Paciugo offers summertime fruit and vegetable sorbets, such as mango cucumber, banana beet and strawberry celery, in addition to gelato that comes in flavors like Mediterranean sea salt caramel and blue cheese pecan. Though they may sound sinfully delicious, Paciugo Gelateria says its gelato meets FDA's standards for healthy foods. Both Laloo's Goat Milk Ice Cream Company and Gaga's SherBetter are also jumping on the low-fat ice cream bandwagon. Laloo's is already catching on with celebrities like Kate Hudson and Jim Carrey thanks to its creamy flavor and low-fat, low-lactose contents. Goat milk also offers nutritional benefits, including 13 percent more calcium than cow milk. Laloo's is introducing two new flavors this month: Capraccino (coffee ice cream with espresso beans drenched in chocolate) and Rumplemint (mint chocolate chip ice cream with organic mint and curls of dark chocolate). Equally enticing is Gaga's SherBetter, which has more butterfat than sherbet, but less than ice cream. It's all-natural, wheat-free, glutten-free, kosher, and low in fat and calories. Health alternatives like this seem to be catching on. According to the company, Gaga's lemon flavor outsold every flavor of Ben & Jerry's ice cream at Whole Foods during the market's 2005 to 2006 fiscal year. If, however, you're searching for heat-inspired concoctions with an alcoholic twist, you're in luck. 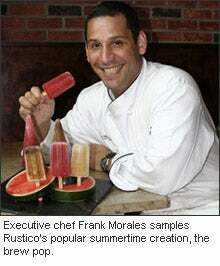 Executive chef Frank Morales has teamed up with beer director Greg Engert at Alexandria, Virginia-based Rustico restaurant to create the beer-lover's ideal summertime snack: brew pops. These icy desserts will be available at the restaurant through September for $5. It's a fitting dessert at Rustico, since many of the restaurant's other items are prepared with beer, too. The pops come in six flavors: Cherry Kriek, Plum Mirabelle, Framboise, Banana, Cassis and Chocolate Stout. Beer isn't the only thing getting a makeover this summer. Get ready for blinged-out, high-tech, luxury ice cream vans and trucks. U.K.-based Innocent Drinks has created two deliciously fun designs for its smoothie vans, including one known as the dancing grass van, which is covered in AstroTurf and has a cow-lined interior. And yes, it actually dances, thanks to its hydraulic system. 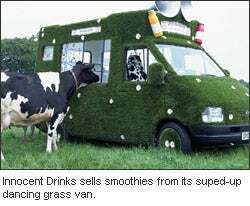 The company also sells its smoothies and drinks from a cow van, complete with eyelashes, horns, udders and a tail. Unique ice cream vans are making their way to the U.S., too. The Tactical Ice Cream Unit--or TICU--touts itself as not only a mobile distribution center for ice cream, but for information and community activism. TICU features acoustic amplifiers, GPS, satellite internet and last, but not least, ice cream. There's obviously no shortage of creativity in the world of ice cream this summer. Don't forget to indulge yourself by celebrating National Ice Cream day on Saturday, July 15.